But then I noticed it says these settings are just for this browser. Your other devices and PCs will still track the living crap out of you. And if you choose to dismiss the privacy reminder you never see it again (and therefore don’t see the handy links) again. WTF, Google?! Please do carry out a Privacy Checkup. Then turn off the tracking you don’t like the look of. Search is Dead, Long Live Ad Search! And tonight I wanted to find out something about BT Infinity, BT’s fibre broadband service. 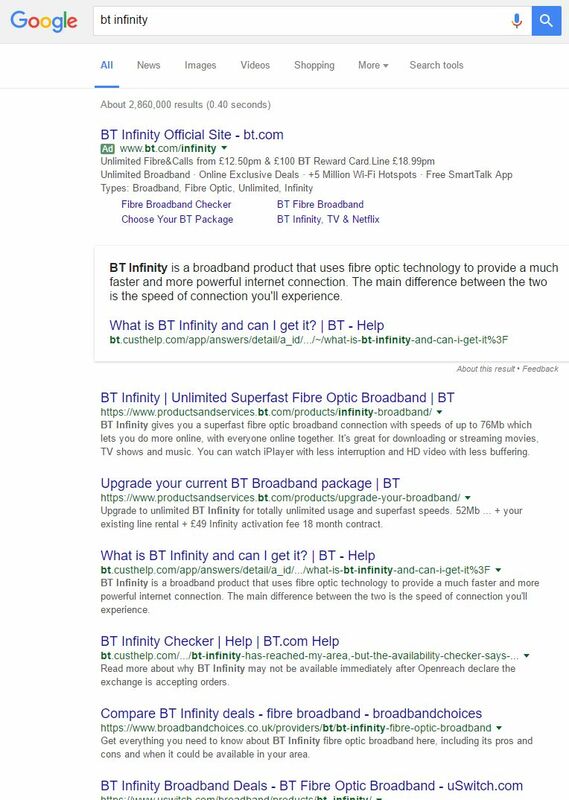 So I put the search term “bt infinity” into Google. Well, that’s pretty specific isn’t it. Google knew what I was after, it showed the result first in the list! No it didn’t, it showed me an advert for the BT Infinity instead. I didn’t ask for an advert, I asked for a result. Those are very different things (even if you make them look the same, Google!). So short of typing in the address myself (removing one major benefit of using a search engine), I’m forced to click on an advert, which charges my ISP for a click, which I end up paying for when my broadband charges next go up. WTF, Google?! So I’ve had enough and I’m moving away from Google as my search engine. I’m switching to DuckDuckGo, which has a stupid name but claims to care very deeply about not wanting to know a thing about you. They could call it FartScroll for all I care, privacy is important to me. Actually, it’s not even all that important to me, unless somebody or some organisation is going out of their way to trick me into giving it up. Then I get so mad… so mad… I blog about it. Let me show you how to do the same, because it’s not as straightforward as it looks. In Chrome, go to chrome://settings (that link won’t work for security reasons, copy it into a new Chrome window or tab instead). (Now might be a good time to make sure the “Do Not Track” option at the top is ticked. It will disappear (of course it will, they don’t want you to change your search engine). But if you scroll up it will be listed alphabetically. You have to hover over it then click “Make default”. And it should appear in the list at the top. 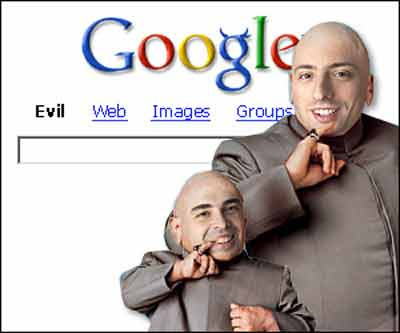 If you’re like me and you don’t like seeing multiple “defaults”, then you’ll want to remove the other search engines. And you’ll feel much better. Of course, if you want to feel really smart instead, you might want Wolfram Alpha instead. That search string would be “https://www.wolframalpha.com/input/?i=%s”.